On the Tuesday the 22nd of January Paul Ward and I drove to Pete Townshend's home in London for me to record a guitar part on a track for a brand new Who album due out this year. The piece is a Townshend composition entitled 'She Rocked My World' about an early relationship. Pete had mentioned in an email a couple of weeks prior that there may be a piece where he can hear some GG guitar featured. The piece duly arrived in the form of an MP3 and had a very flamenco feel to it composed around a B flat to A sequence. I set to work and came up with a few ideas. I then asked the question when? Are you free next week came the reply? So no pressure there then! Paul and I arrived at Pete's beautiful home at 2-40 pm and was in recording mode by about 3-15. Pete is the most gracious and patient person you could wish to meet, and it appeared that he liked virtually everything I put down using words like "great" and "brilliant" after each take. We were pretty much done and dusted by 6-pm and ready to hit the road in fairly heavy snow and rush hour traffic. 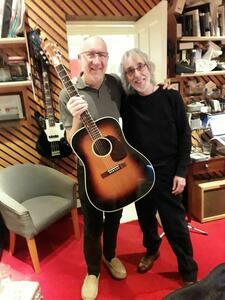 Before leaving I presented a guitar to Pete in the form of a 1966 Levin acoustic guitar just like the one he had stolen as a teenager after loaning it to John Entwistle. John's Mum gave Pete three pounds to compensate for the loss!! On opening the case his eyes lit up and he thought it looked beautiful and after picking a few notes declared that it sounded great. Paul took this slightly out of focus pic of Pete and I, and as you can see by Pete's broad grin he was very happy. Within two days of the session he had posted this beautiful item on the Who website about me, the track and indeed the day. You can hear a little snippet of part of what I recorded. If anyone had ever told me that one day I would be in the studio with this towering genius and would be utilising my guitar skills I would not have believed them. Life can be strange at times and after a very challenging twelve months there was a little silver lining in the cloud formation of life. I'm humbled, grateful and thankful. Pete referred to my contribution as "classic GG." At the beginning of November an official looking envelope landed on our door mat along with a few other bits of correspondence. Hilary brought the post through and using a sharp knife opened all the envelopes. The official looking one she left for me to open saying that it looked boring, and boring it did indeed look. On first glance I thought it might have been something from the tax office or a hospital letter. Anyway I removed the letter from its boring looking envelope expecting see something about tax or some such thing. 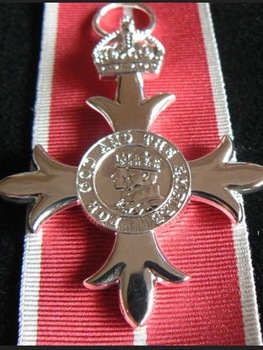 When I started reading it I could not believe my eyes as the letter was stating that I was to be the recipient of an MBE for "services to music and charity". I could hardly catch my breath, and asked Hilary if she knew what this letter was, which was a daft thing to ask as she hadn't even read it! When I told her of its contents, like me she was stunned! How could this be? People like me don't get put on the honours list, this only happens to other folk not the likes of me. The letter stated that my discretion would be appreciated and not reveal this news until 10-30 pm on the 28th of December when the honours list would be made public. As you can imagine it was very hard to keep this a secret and not even tell close family. But this had to be done otherwise it might have jeopardised the whole thing. I filled in the form saying I would be happy to accept this honour, and not only posted it to them but also emailed it them to make doubly sure! Every year on December 28th our friends Paul and Christine White throw a post-Christmas party for friends and musicians in their lovely Malvern home. We try to attend each year and this year was no exception. I finished my short set for the assembled gathering, and as I did so Hilary stepped up to the microphone to announce that I would be getting this MBE. As I glanced at my watch I saw that it had just gone 10-30 so that was OK. Having said that, I still didn't really believe it, and it wasn't until I looked on line and saw my name that I finally believed it was for real. As wonderful as this news is, it did carry a degree of bitter sweetness. How lovely it would have been to have shared this news with my dear Jamie. God he would have been so chuffed! It is all well and good getting this wonderful honour but this doesn't happen by itself. Words are not enough to thank our dear pal Carrie Martin who unbeknown to us campaigned tirelessly for three years to help make this happen. Not only her but the many friends who apparently wrote lovely letters of kindness and recommendation and others who helped along the way with the application – THANK YOU, you know who you are. 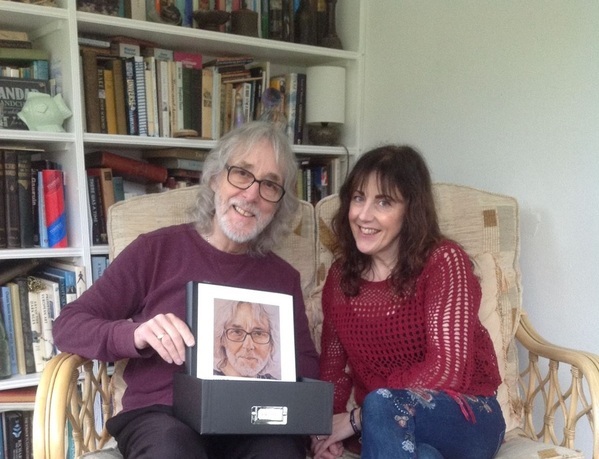 Here is Carrie and I with the folder she created containing all the letters and correspondence related to getting my MBE. 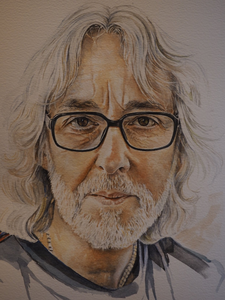 The cover is that lovely portrait by Sue Martin who kindly had it enlarged for Carrie. 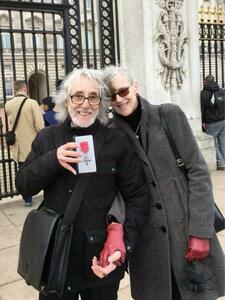 A date of March 7th has been set for Hilary and I attend the presentation at Buckingham Palace. I have no idea who will be presenting the award. It may be Her Majesty the Queen, but either way it will be a member of the Royal Family. I'm only allowed three guests so along with Hilary will be my daughter Sadie and her partner Gordon. Carrie and husband Darren will be there on the day but sadly will have to wait outside until procedures are over. Since this was made public I have been in the local paper, on Midlands Today news and was a clue in The Telegraph crossword. Fame at last eh? I still can't believe this has all happened, and truly this honour extends to everyone who has believed in me from the word go and to Hilary for her love and devotion these past 33 years. Without her none of the "good stuff" would have been written. The date for our Palace visit has been set for March 7th. Watch this excited space!!! By the time you read this the NAMM show in California will have come and gone, and hopefully the beautiful new JG will have created a bit of a stir. Awarded an MBE in the New Year’s Honours list in January, veteran guitarist Gordon Giltrap also has new guitar, designed as a tribute to his late son Jamie, about to be revealed at Winter NAMM next week by Vintage. The VE3000MGG is an electro-acoustic described as ‘a labour of love’ by Giltrap, luthier Rob Armstrong and Vintage brand owner and international distributor JHS. 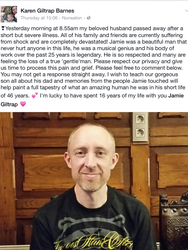 In January 2018, Jamie Giltrap, a popular Drum and Bass musician and son of Gordon Giltrap, sadly passed away. The decision was swiftly taken by Gordon and JHS to create a lasting tribute to Jamie’s memory, and plans for the production of the VE3000MGG were quickly begun. The VE3000MGG’S classy appearance is rounded off with a set of gold plated Grover machine heads, and a further inlay of abalone around the sound hole. Finally, at the headstock, the Vintage logo is also inlaid with abalone. 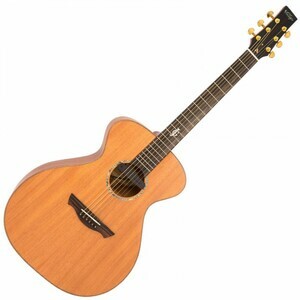 The guitar is equipped with a Fishman NEO-D humbucking sound hole pickup. Unfortunately it won't be in the mag itself but this is nice profile for all things GG related especially the teaching side of things. Saturday March 16th marks the beginning of my SHARING DAYS 2019 season.And who better to have as my special guest than the wonderful Ken Nicol. Ken's reputation as a guitarist and Banjo player goes before him. 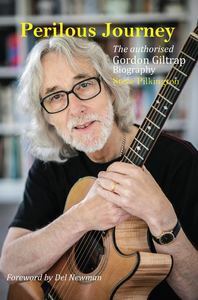 He has worked with some of the finest names in acoustic music today, from being guitarist with Steeleye Span through to Magna Carta, plus numerous session work in between plus world tours. 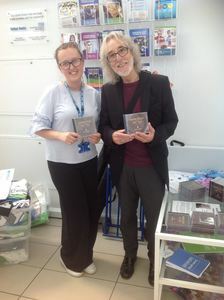 Don't miss out on the chance to meet this fine musician, who I know will be armed with his signature Ken Nicol Fylde guitar,and possibly his banjo. To book your place email ggiltrap+sharingday@gmail.com. Sue Holton will be delighted to hear from you. If you would like to attend a Weekend Workshop then my Guitarist's Development Group might be ideal for you. It is a learning opportunity for guitarists of all abilities to help you take your playing to the next level. 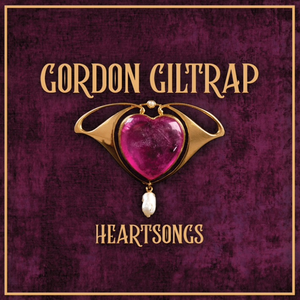 Coaching will be led by Gordon Giltrap who will be supported by Will McNicol who Gordon rates as “one of the finest Guitarists and Composers on the scene today”. 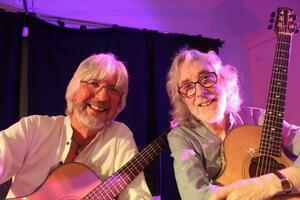 The style of the weekend will be relaxed and informal with both group and individual coaching from Gordon and Will. Many of you know of my long standing friendship with Paul White over the years. Paul along with our friend Mark Soden create really lovely soundscapes and occasionally I contribute the odd guitar lick here and there. 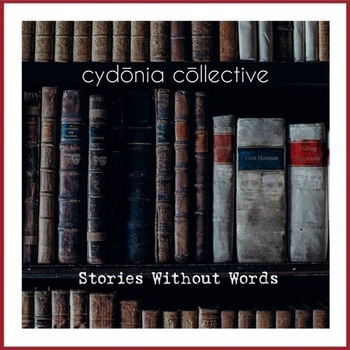 This time I appear on tracks 'White Leaved Oak' and 'The Palace on Wheels' on their fifth album: 'Stories Without Words'. Do check out the latest release. It's very chilled out and relaxing, or as Paul describes it: "The music, which is essentially instrumental, is hard to put into a box but might be described as ambient/cinematic/chill/neo-classical — or not as you see fit. The album is now live on most of the streaming and download sites including Spotify"